I didn’t grow up with a Baba to teach me how to make cabbage rolls, but I did grow up eating them. I think local Babas (Ukrainian grandmothers) took pity on us, because once in a while a tray full of home made, hand rolled goodness showed up on our counter. To a hungry cabbage-roll-loving kid, those food gifts were like gifts from God. My own Grandmas were of French, German and Hungarian backgrounds, so their cooking came with it’s own special perks, like home made tourtière, sauerkraut and poppy seed roll. My Hungarian Grandma did make a cabbage and beef mince casserole she called ‘lazy cabbage rolls’. Being Hungarian, her seasoning of choice was a liberal amount of paprika! I suspect that my own mom had ‘no time’ for such time consuming dishes, though she would spend all day making a batch of her fabulous home baked bread and sewing. Want to Know How? Go to the Source! 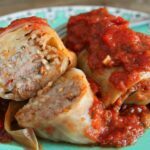 When I was finally ready to begin rolling my own cabbage rolls, I asked for instructions from some Ukrainian relatives and friends but I never really found a recipe that contained the flavours that I liked. Since many of them suggested using canned tomato soup as a sauce base (and I am morally opposed to cooking with a can of soup), I knew that it was up to me to experiment on my own. One bit of advice that found very helpful was to boil the whole cabbage (core removed) in a large, salted stockpot of water. The cabbage leaves separate and soften, making it much easier to roll them over the filling and ensures that they are soft and tender in the final dish. There’s really no need to include the roasted red peppers, I just added them because I had some in the fridge that I needed to use up. You can omit them from the sauce, if you wish. What really makes a difference in taste though, is using a high quality tomato sauce or passata (not tomato soup!). I make my passata every fall, it’s one of my least favourite but most rewarding three days of preserving because enables us to enjoy the taste of summer tomatoes all winter long. 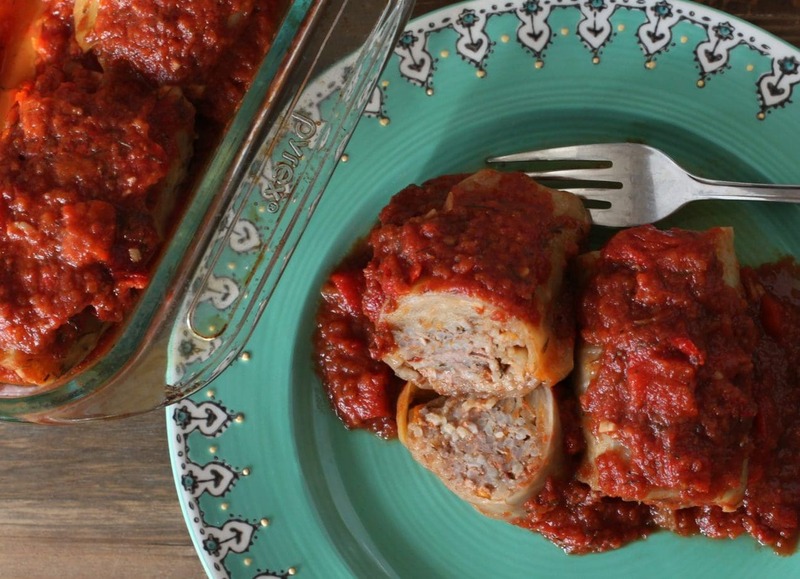 Make your own cabbage rolls like a Baba. Immerse the whole cabbage in a pot of boiling salted water. Remove each leaf once it starts separating from the cabbage and drain. Add garlic, 1/4 cup dill, diced peppers to the bottle of passata, cover and give a good shake. Pour a small layer of passata into the bottom of a 13 x 9 pyrex baking dish. If there is still a thick vein at the base of the cabbage leaves, snip it out with a pair of kitchen shears. Take a large handful of the ground beef mixture and compress into an oblong meatball shape. 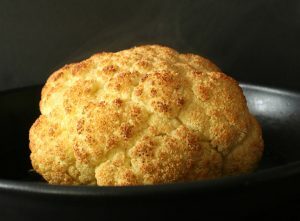 Place the oblong meatball just above where you snipped out the thick vein, fold the sides over and begin to roll upward. Place in baking dish seam side down. Repeat for each roll, leaving a small bit of space in between each in the baking dish. Pour the rest of the passata over top of the rolls, filling the dish until just the tops of the rolls are out of the passata. You can add a bit of water if you don’t thing it will be enough. Cover with foil and bake for an hour at 350 F.
Oh Bernice, these sound AWESOME! I’m part Ukrainian, and my grandmother always had pierogi and cabbage rolls at Christmas. SO GOOD. I need to come up with a vegetarian version so I can indulge. I’ve never had them with dill or roasted re pepper, but it sounds fab. I don’t see why you couldn’t. 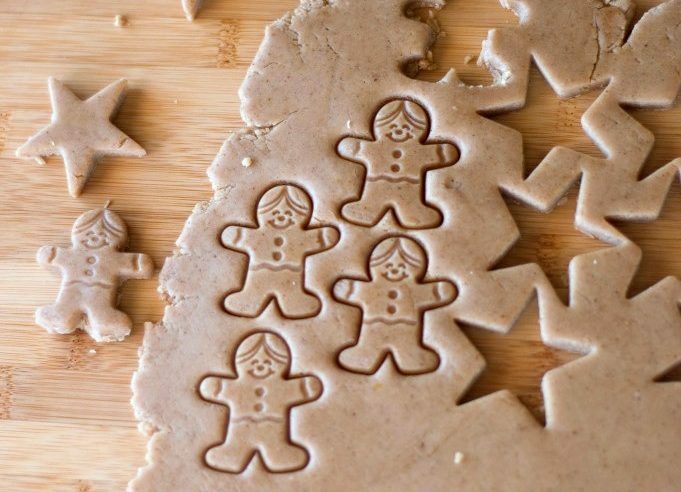 A traditional Ukranian Christmas Eve feast is vegetarian and I have a few friends that make these with plain rice or bulgur (I think). 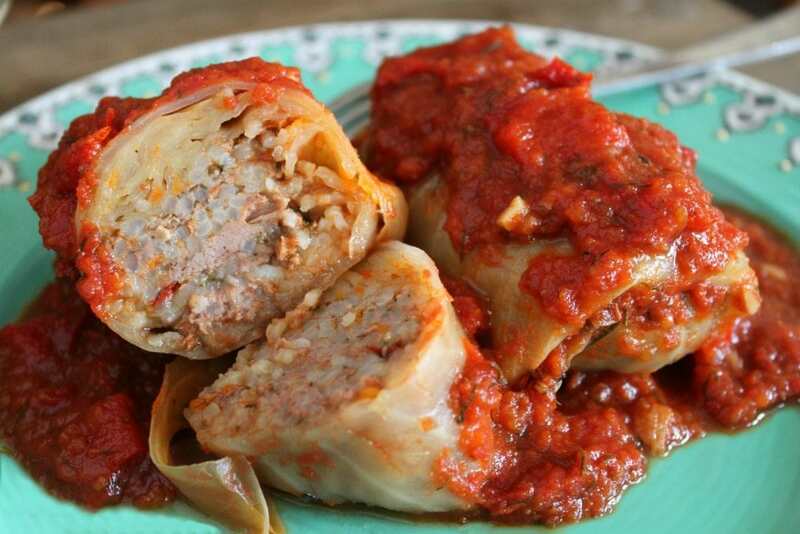 Thank you for creating and sharing this cabbage roll recipe – without canned soup! Thanks for stopping by…I bet this sauce was a lot closer to the original sauce, you know…before the days of canned soup! Those Cabbage rolls look soooo delicious! That is comfort food for a cold winter day! And comfort food that maybe isn’t so bad for you after all. It’s a win-win! Cabbage rolls are a staple in our home during the holidays. What a great take on including dill and roasted red peppers to liven them up. Mmm…. thank you so much! We can’t have ham and perogies without cabbage rolls! Mmm yum! 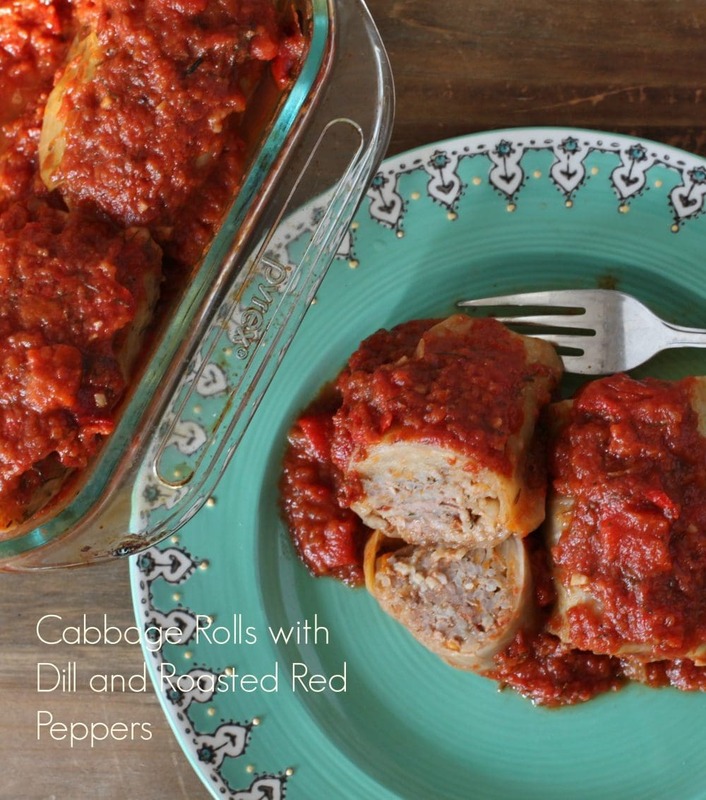 I love cabbage rolls but have never tried adding roasted red peppers! What a great twist on a Ukrainian classic. This looks delish Bernice! Thanks, it was kind of a spur of the moment thing…they needed to be used up! Thanks for stopping by! These look great, Bernice! 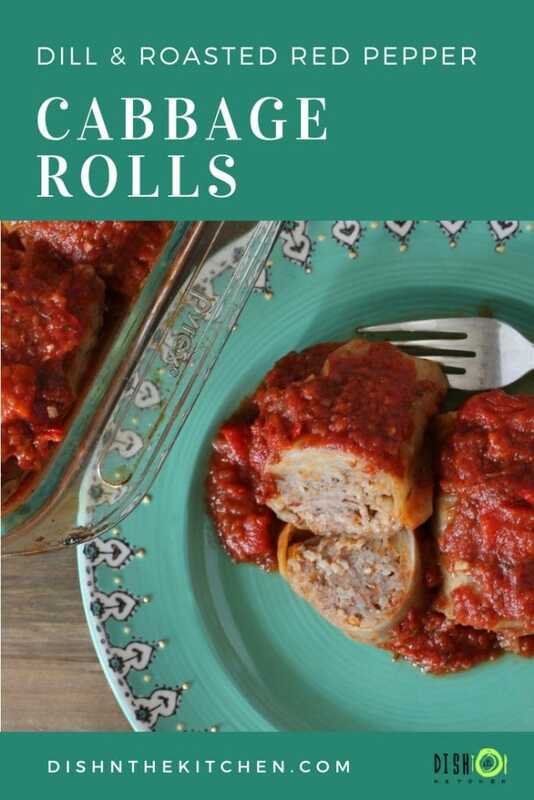 I love cabbage rolls and have always been searching for a great recipe. I LOVE your use of dill — I bet they’re delish! I’ve just pinned and will report back. Have a great weekend! Awesome! Thanks for stopping by Justine. Ah I’ve made a few of trays of these I am finding they really aren’t that much work at all. I grew up with only one Ukrainian family member, and that was by marriage, but I think growing up in Alberta means that you can’t really help but absorb a good deal of that spectacular Ukrainian food culture. My mom would make cabbage rolls occasionally when I was a kid, and to be honest they were never my favourite, but I think that had more to do with the filling and the specifics of the ingredients. Now that I’m all grown up and constantly experimenting with my own food, I think it might be time to revisit some of the Ukrainian classics of my prairie homeland and start experimenting (perhaps with roasted red peppers and dill?). Cheers! You grew up in Alberta? Did I know that? I think there’s definitely room for experimenting with cabbage rolls. Anxious to see what you come up with! Yes indeedy. Grew up in Edmonton (or Edmonchuk, as we legitimately like to call it thanks to its wonderful Ukrainian connections). Even though I’m not Ukrainian, I grew up with perogies, cabbage rolls, kielbassa, and so much more. Hell, I’ve even decorated true Ukrainian easter eggs (though I’m sure mine weren’t any good). My wife (whose parents are from Taiwan) grew up in Lethbridge, and even SHE totally identifies with Ukrainian food. It’s inescapable! oooo I forgot about the bacon kind of cabbage rolls!! OMG so good. Did you ever make the kind with mushroom soup?